In conjunction with ForeFlight 8, ForeFlight on the web features a number of updates that are now available for ForeFlight subscribers, including the ability to file flight plans, generate weather briefings, and manage aircraft profiles. You can also access and plan flights with our new global Aeronautical Maps. Log in to ForeFlight anytime using your ForeFlight Mobile credentials and access ForeFlight’s powerful flight planning from your desktop computer. ForeFlight’s powerful flight planning capabilities are available on your desktop computer. Familiar Route Editor and Navlog views make it easy to build and edit a route using text input or rubber band planning. ForeFlight’s auto-complete search engine returns results as fast as you type based on waypoints, navaids, airport names, routes, and city names. Just like on ForeFlight Mobile, Route Advisor™ allows you to simply enter departure and destination identifiers into the Route Editor, then select from available route suggestions including airway, recently cleared ATC routes, preferred routes, or TEC routes. Route Advisor helps you select from available route suggestions. You will also see a new Aircraft tab on the left-hand side; here you can create and edit aircraft profiles. When you add performance data, the Navlog computes your route time and fuel burn, just like in the mobile app. The best part is that any aircraft profile changes you make on the web are automatically synced to your mobile devices. 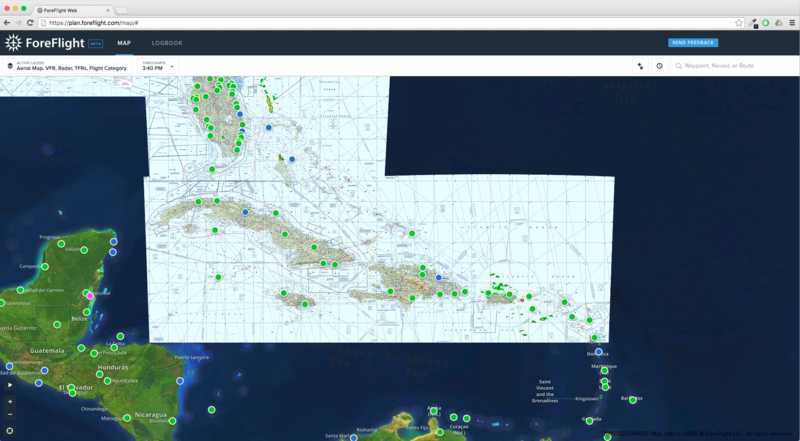 In addition, the new global Aeronautical Maps look stunning on a desktop browser and include many of the same benefits as the mobile app, like dynamic decluttering, customizable information, light and dark themes, and Smart Airway Labels. All of the same file and brief features you enjoy on ForeFlight Mobile are available via the web. You can amend and cancel IFR plans and activate and close VFR plans – and it’s all instantly synced to your iPad and iPhone. In the Aircraft view, you can add ICAO equipment and performance codes, and ForeFlight pre-populates your flight plan form with this information. Generate ForeFlight’s Graphical Briefing right from your desktop computer. ForeFlight’s Graphical Briefing can be generated on the web. Graphical Briefing transforms the standard text briefing information and delivers it in a visually elegant design for better readability – and it looks amazing in the full desktop view. In addition to experience reports and the 8710 report, student pilots will enjoy keeping tabs on accumulated flight time towards their PPL or Instrument Rating using the new Progress Reports. These reports use data from your logbook entries to display a checklist of requirements needed for each, checking off each item as you complete it. ForeFlight Logbook Progress Reports help student pilots keep an eye on the prize. ForeFlight on the web gives you more flexibility to plan and file when and where it is convenient. You can log in to ForeFlight anytime using your ForeFlight Mobile credentials. Access to Logbook features and the new Aeronautical Maps requires a Basic Plus or Pro Plus subscription plan. If you need to make changes to your subscription, you can do that on the web, too! 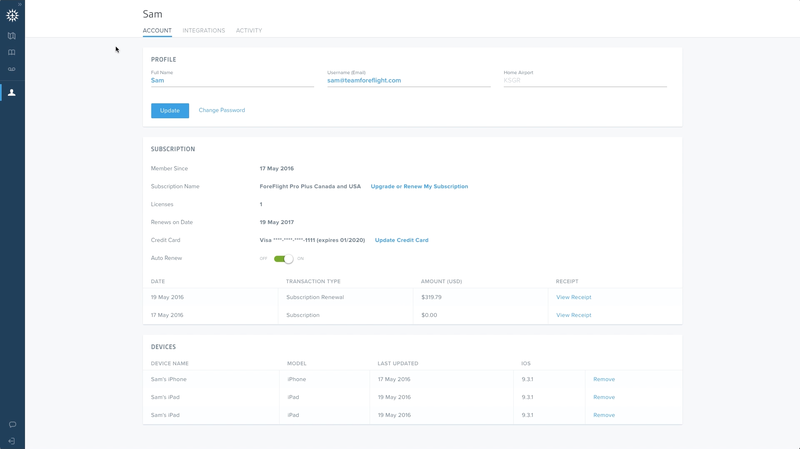 In this unified interface, you can now view, renew, or upgrade your subscription, add or remove devices linked to your account, connect your account to outside services like Dropbox, and view your in-app comment history. Multi-pilot acco unt managers also have full control over the pilots and devices on their account, which are now accessed from the “Users” tab in the left-hand menu bar. Sign in to ForeFlight Web by clicking the Login button at the top of ForeFlight’s homepage and entering your ForeFlight username and password, or by signing in at plan.foreflight.com.